Andrew "Andy" Lynn Sweat, age 61, of Whiteville passed away on Wednesday, October 3, 2018. 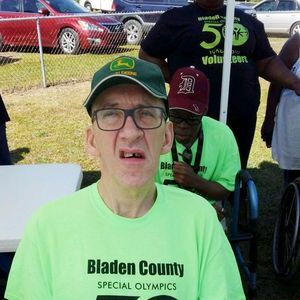 He is survived by his mother: Hannah Rose Gooden of Elizabethtown, three brothers: Jerry Sweat and wife Beverly of Bladenboro; Billy Sweat of Boiling Springs Lake; and Neil Gooden and wife Pam of White Oak. Andy was generally happy all the time, and loved people, but when he was with his family, that was when he was the happiest. He loved spending time with his brothers and especially his nieces and nephews. Andy loved all kinds of sports. If his team scored, he could be heard shouting all through the house. Andy will be missed more than words can say. Our lives will never be the same without him. The family will receive friends on Saturday, October 6, 2018 from 1-2 pm at White's Creek Baptist Church in Clarkton followed by a funeral service at 2:00 pm officiated by Rev. Kincy Barrow. Burial will follow the services in the church cemetery. Add your thoughts, prayers or a condolence to Andrew Lynn's guestbook.